Paris Saint-Germain are a club with a major financial advantage over most of its competitors, fueled by the heavy investment in the squad by their owners – Qatar Sports Investments. They have succeeded in climbing up the ranks in the past years and now sit among the biggest names in football. They have influenced the likes of Zlatan Ibrahimović, Thiago Silva, Lucas Moura and many more big names to put pen to paper and sign for the club. Nkunku’s playing style is similar to that of Marco Versatile. He is even capable of switching to the right and left sides of the midfield. His technical abilities and intelligence on the pitch make him a stand out talent amongst others of his age. The versatile midfielder will need to gain a bit of experience before he is ready to command PSG’s midfield. Definitely one to look out for in the near future. Kimpembe is a 20 year old French defender who joined the PSG youth academy in 2005 and managed to get into the PSG B team in 2013, where he made 36 appearances and scored 1 goal. Presnel made his professional debut in a 1-3 win in the Ligue 1 in October 2014. Presnel is a confident, intelligent and strong defender. The 20 year old has an above average physical presence compared to other players of his age. He quickly adapts to the situation presented to him and doesn’t waste time in making decisions. Kimpembe has what it takes to be a great leader in the next 3-4 years, and is probably the most likely youngster to captain PSG in the near future. 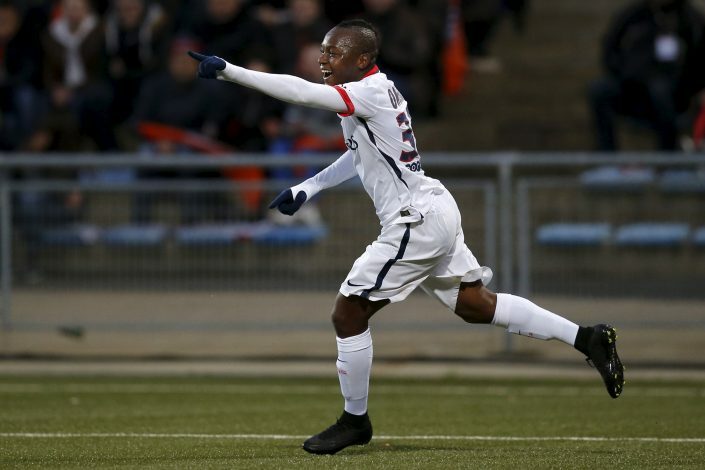 Ongenda is a 20 year old winger who joined the PSG youth setup in 2006. He managed to climb up the ranks into the Paris Saint-Germain B squad, making a total of 28 appearances and scoring 9 times. In January 2013, he made his professional debut against Arras in the French Cup. During his time in the senior squad, he has managed to score one goal in the 8 opportunities he has been given. Hervin is currently on loan at Ligue 1 side SC Bastia. His current spell isn’t helping him much as his form has been going down. But he is a player of immense potential; able to create scoring opportunities and has a relatively powerful shot. His technical abilities still need some smoothening, but he is at a level where we are able to see him as a bright, young prospect. Alec has a sweet looking future ahead of him, provided he gets his debut soon and gains some experience playing at a higher level. Lorenzo is yet to make his professional debut with the senior squad, but at the level he is playing, accompanied with his composure and resilience, he isn’t far from breaking into the first team squad. Definitely another player to look out for in the coming years. So it goes to show, PSG have the means to attract almost any footballer in the world using their massive financial reserves, but they have still managed to put together a very promising youth academy with astonishing starlets. There seems to be more to the club than just money.